I don’t like to listen to Christmas music or put the Christmas decorations up until after Thanksgiving. Now that Thanksgiving is over we can officially start celebrating Christmas. Bring on the Bing Crosby, Christmas lights, and candy canes. I spotted eggnog in the store the other day and bought a quart to help put us in the festive mood. I personally don’t like to drink eggnog, but I thought it would be fun to bake with it. To kick off the holiday season, I made Mini Eggnog Doughnut Muffins. I’ve made doughnut muffins and baked donut holes a few times and they are always a hit. I figured eggnog doughnut muffins would be perfect for the holiday season. I added eggnog, cinnamon, and nutmeg to the muffin batter. 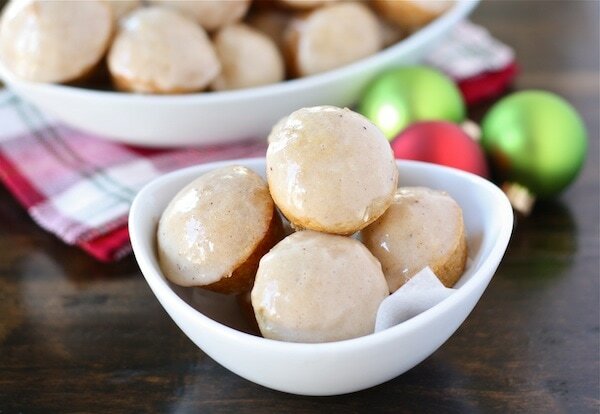 When the doughnut muffins were finished baking, I dunked them into an eggnog glaze. The eggnog flavor isn’t overpowering, but you can definitely taste it. 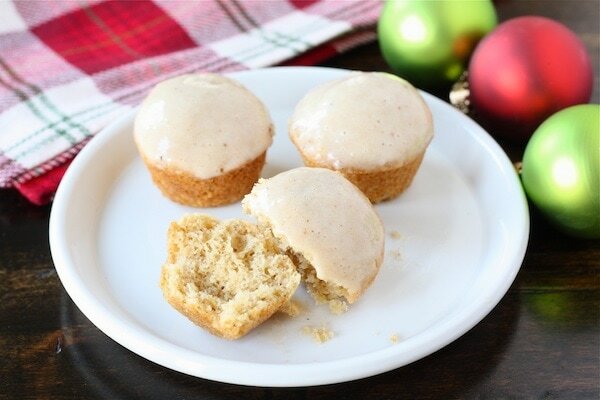 These eggnog muffins are perfect with a glass of milk, tea, or coffee. And if you really like eggnog, wash them down with a big swig of the creamy holiday drink. I think these Mini Eggnog Doughnut Muffins would be perfect for a Christmas morning breakfast or brunch. They are easy to make and easy to eat. Be careful, the mini muffins are easy to pop into your mouth. I lost count after eating two:) Go buy some eggnog while it is in season and get baking! The holidays are here! 1. Preheat the oven to 350°F. Lightly grease 2 mini muffin pans or 1 regular muffin pan. Set aside. 2. 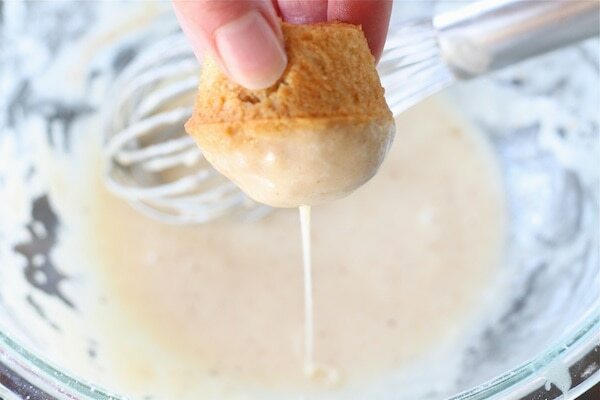 In a large bowl, using a mixer, cream together the butter, canola oil, and sugars till smooth. Add the eggs, beating to combine. 3. 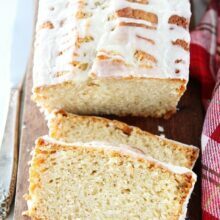 In a medium bowl, whisk together the flour, baking powder, baking soda, nutmeg, salt, and vanilla. 4. Add the dry ingredients into the butter mixture alternately with the eggnog, beginning and ending with the flour and making sure everything is thoroughly combined. 5. Spoon the batter evenly into the prepared pans, filling the cups nearly full. Bake the muffins for 10-12 minutes, or until they're a pale golden brown and a cake tester inserted into the middle of one of the center muffins comes out clean. Remove muffins from the oven, and let them cool for a couple of minutes. 6. To make the glaze, combine butter, sugar, eggnog, vanilla, cinnamon, and nutmeg in a large bowl. Whisk until smooth. Dip the tops of each muffin into the glaze and let cool on a wire cooling rack until glaze sets up. I have not bought egg nog in at least five years/ 5 Christmas seasons…since before my daughter was born. But I bought some…yesterday. Now I have an idea of what to do with it. These look incredible!! I don’t really ever have eggnog but these doughnuts like too good to resist! I totally agree! It’s time to get out the Christmas stuff! I totally am in the Christmas-y mood now! Thanksgiving ending flipped the switch. These are so cute! And i love the decor to go with the dish. They just came out with soy nog I’m thinking of trying. These are adorable and that glaze looks fabulous!! Love it. I’m so happy it’s the holiday season! I love everything eggnog, so these look amazing to me! These sound so yummy! Hooray for the Holidays! I love mini anythings! These are adorable. I’m the same way – no Christmas until after Thanksgiving! These look like the perfect way to kick off the season! These look so cute! I love the mini size. I bet my hubs would love them since he’s a fan of eggnog. I love doughnut muffins! Love theses flavors too. I’m a fan of waiting until after Thanksgiving to start Christmas celebrations. One holiday at a time for me, please. These are the perfect way to kick off Christmas celebrating! These little doughnut muffins are too cute for words! I’m not the biggest egg nog fan, but just a hint in these sounds perfect! Plus they’re so cute and bite sized. Who doesn’t love that?! tis the season – and almost guilt free! I’m not a fan of eggnog as a drink either, but I’m thinking it might be really good in something like this! I like to bake with eggnog too. These look like such fun and perfect for a toddler breakfast treat. Stop by my blog next week, I am kicking off my holiday breakfast series with an Eggnog French Toast w/ Cranberry Apple compote recipe. I make it every Christmas morning and am excited to share it. These are so darned cute! These would be dangerous in my home, though. I could see myself stuffing a few in my mouth each time I walked by them! Christmas breakfast perfection. I love it! i can hardly stand how cute these are. LOVE THEM. I’ve never tried baking with eggnog. What a great idea! I might freak out at how cute these are. Those are THE cutest little things ever and sound so delish! Great idea! These look like the best use of eggnog I’ve seen. So creative! these little donut muffins look sooooo delicious! i’ve never had an eggnog flavored dessert & i think these would be perfect!!! ahhhh they’re so cute!!! These are so cute and mouthwatering! Thanks Maria, I now have my holiday muffin recipe. I am so sure I’ll love these. Hopefully I’ll do them before Christmas. I don’t love to drink eggnog either (except in lattes) but I DO love a good baked good infused with it! I’d be popping these like crazy! Yummy! This recipe marries the two things I’ve been dying to make…Eggnog inspired goodie + doughnuts! YES. My husband will be happy about this one too. Thanks. These would be perfect for Christmas morning, my boys will love them! I just happen to have some eggnog in the refrigerator… I think I need to make these beauties. These are so cute! I’m I the odd one out? I love eggnog-good eggnog, that is. 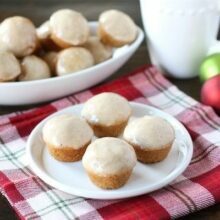 Never thought of cooking with eggnog, your mini muffins look delicious and the recipe is so simple, must try. I’m the same way–no Christmas until after Thanksgiving! These mini eggnog doughnuts look like a perfect holiday breakfast treats. Nice way to celebrate th eholidays! These muffins really look and sound awesome, I love eggnog just about anything and recently I made eggnog fudge. This is on the list of things I want to make in the near future. Thanks! I saw eggnog in my store’s weekly ad for this week and I will definitely be picking some up. I am like you in that I don’t like to drink it. I’m a skim milk girl and eggnog seems like drinking melted ice cream. But I love the flavor of it and am looking forward to baking with it! You had me at eggnog! Can’t wait to bake these up for Christmas!!!! <3 Thanks so much! Oh Maria. You should be thankful that I don’t live close to you. I’d be on your doorstep like a lost puppy everyday! You make the best baked goods ever! 🙂 I totally love eggnog (and donuts) and these look fantastic! Thanks for sharing! I love everything eggnog, these muffins look fantastic. Thanks for sharing! I love egg nog so I have to say, whenever I see eggnog anything I’m thrilled and these are no exception. Though I have to say the concept of donut muffins has always puzzled me a bit because i always think of baked donuts as being similar to cupcakes/muffins just baked in a different pan. What a festive idea to make for the holidays! These look DELISH! Can’t wait to make them this weekend! Oh yay, I have some eggnog I’ve been trying to use up, these are definitely going on my to-do list! These are all about Christmas flavors…love it girl!! omg love these! what a great take on donut muffins! Maria, such a cute way to use eggnog — I tend to use it in french toast, cheesecakes, and creme brulees. I like having bite-sized treats around during the holidays so I can indulge without going overboard. I can smell them baking….Maybe its ‘been suggested: I would put some red & green food coloring in separate batches of the glaze. Lovely touch for Christmas~! I don’t like eggnog as it is…But I love it when mixed with other flavors. I love eggnog based treats like what you have posted. This is superb! I love the mini size!Let’s get Christmas started…Thanks for sharing! I totally agree about the no Christmas stuff before Thanksgiving, but the day after Thanksgiving all bets are off! 🙂 These look so delicious! I’m so exactly the same way…give Thanksgiving it’s due! And yet…this year, I couldn’t resist the music. I started a new Pandora radio that plays only gentle, piano Christmas music. It was seriously perfect for Thanksgiving Day. It was like a Christmas music teaser. I really love it. The doughnut muffins were amazing! If not for my upcoming wedding, I might have polished off all of the extra glaze. I made these for our tree trimming party tonight. I had to taste test one. YUM! They also got a big thumbs up from my 8 year old. My 3 year old wasn’t so fond of them but she absolutely loved the pumpkin ones. I had to make both of them. I couldn’t decide. They are both delish!!! Glad you liked the doughnut muffins! we just made these and finished the last one today! What a yummy Christmasy treat 🙂 Love the mini muffin size and the “healthier” take on doughnut holes, being baked not fried. My three kiddos love muffins and ate these up! Thanks for a fun recipe, love your blog, I too LOVE to bake cookies. 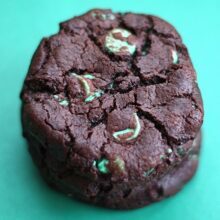 Just made these for a holiday get together and wanted to say they are fantastic and a huge hit! They really do taste like little doughnuts! Will be using this recipe every year. Love your website, thanks for the great treats. Am I crazy or is 1/2 cup of eggnog in the glaze a lot? I used 1/4 cup and found it to work well for a nice thick but not too thick glaze. I used 1/2 cup and it was fine. Feel free to use less if you wish! Since I had such excellent results with the pumpkin cake donut hole recipe, & got egg nog at the store on special AND coupon, thought I’d make these this morning. Oh heavens! Delish!! 🙂 Another sweet success! I only used one egg, but in retrospect, I think another yolk would have made it taste a wee bit more ‘egg noggy’, LOL. I might add a T. of rum next time too. Once again, I used only freshly grated nutmeg. Since hubby’s got diabetes, I used the baking sucralose to replace 1/2 the white sugar. I baked them in the electric donut hole machine and (once again for hubby’s sake), only drizzled the glaze on. I have a lot of glaze left now in the fridge and am either going to spread on pancakes or use between layers of a cake. Ooops! forgot to post a link so you could see the photo of mine this morning, on my facebook …. Hope this works so you can see them! I stored them on the counter in an air-tight container. Love eggnog!! These mini muffins are adorable. What a great idea! Merry Christmas!! I made these this morning!! They were a hit. Love the eggnog glaze!! I still have 1/2 of it left, but I’m sure I’ll use it up 🙂 Thanks for the great holiday recipe! I make muffins every Monday for the teachers I work with and did these last week. They were heralded as the best I have made this year! Thanks for the recipe! Yay! so glad the muffins were a hit! 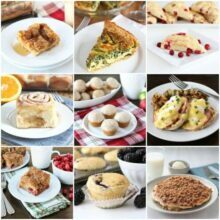 I want to make these as regular size muffins but can you tell me please how long I would need to bake them? Also, same oven temp? Thanks! Just made these and they are delicious! I’ve made a lot of glazes in the past and for some reason my glaze got kind of gummy. I used low fat egg nog but I wouldn’t think that would have affected it. Maybe I over whisked it? It also wasn’t as white as yours was, but I did add a tad more cinnamon. Pingback: Mocha Eggnog Sundae from Never Enough Thyme — Never Enough Thyme - Recipes with a slight southern accent. These are delicious…perfect with a cup of coffee! Only question is what to do with the leftover glaze…sugar cookie glaze?? ?